PHUKET: Phuket Governor Norraphat Plodthong has disclosed at a meeting today (Sept 28) that a new, short-term beach safety team made up of navy officers, freelance lifeguards and Civil Defense Volunteers will patrol Phuket’s beaches to ensure the safety of tourists when the Phuket Lifeguard Service contract ends on Saturday (Sept 30). “We will have an integrated team of officers from the Royal Thai Navy Third Area Command, Civil Defense Volunteers, and lifeguard staff,” said Gov Norraphat. The meeting was held at Phuket Provincial Hall at 11:45am today with Vice Governor Snith Siriwihok, Phuket Provincial Administration Organisation (PPAO) Acting Chief Administrative Officer (Palad) Watcharin Patomwatthanapong, officers from the Royal Thai Navy Third Area Command and Civil Defense Volunteers in attendance. “All beaches on Phuket will have security for tourists. There must be no gaps in performance,” he said. PPAO Acting Chief Mr Watcharin said that after the Phuket Lifeguard Service contract ends on September 30, the PPAO will directly employ individual lifeguards at a monthly wage of B14,000 per month, the same rate as the current lifeguard wage. “In the meantime we will await the re-draft of the Terms of Reference (TOR) to re-define the terms of employment to be consistent and appropriate for the work of current lifeguards,” said Mr Watcharin. “The safety of people and tourists is important. The preparation of beach staff throughout Phuket must be consistent, with no gaps, as Phuket is a world-class tourist destination and tourists have to be confident in Phuket's lifeguard system and assert that our beaches will be safe,” he said. V/ Gov Snith Siriwihok noted that high season is approaching, including Golden Week from October 1-10, which sees an influx of tourists from China. “According to the Tourism Authority of Thailand, it is predicted that Chinese tourists coming to Thailand that week will be more than 300,000 people, and no less than 50,000 of them will travel to Phuket. So security measures for tourists is our number one priority,” he said. 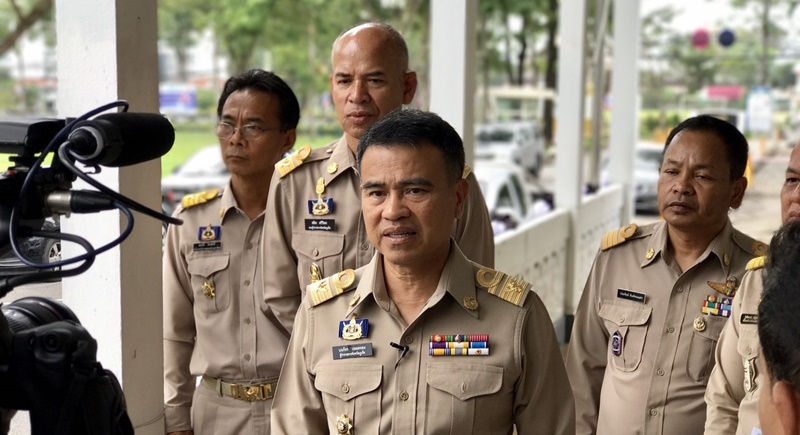 Head of Phuket Lifeguard Service Mr Prathaiyuth Chuayuan told The Phuket News today, “The Governor called relevant officials including the Navy and Civil Defense Volunteers to urgently implement measures to look after beach safety. Meanwhile, the PPAO acting Chief has said that they will directly hire lifeguards to work for the same salary of 14,000 baht. “In conclusion, Phuket Lifeguard Service as a company will not continue,” said Mr Prathaiyuth. With changes set to unfold in a few days, Phuket Lifeguard Service continues their final days of work, having rescued two people from drowning in the past two days, including a five-year-old Russian boy at Nai Harn Beach and a man caught in a rip tide at Surin Beach. “Both were rescued in time and were safe after resting on shore. Neither needed to go to the hospital,” said Mr Prathaiyuth. Additional reporting by Shela Riva. Let us pray that all the members of the out of the blue short-term safety teams, replacing Sunday the professional Phuket ligeguards have a life saving swimming diploma, + experience of course.